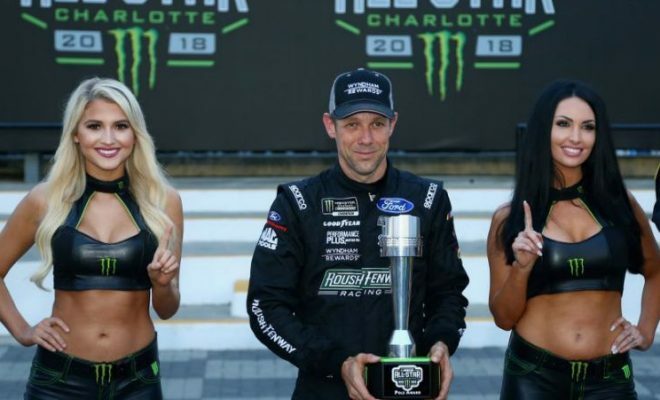 CONCORD, N.C. — Matt Kenseth, in his second race back with Roush Fenway Racing, will start the All-Star race from the pole. Teammate, Ricky Stenhouse Jr. will start alongside in second, giving the team it’s first front row sweep since the 2013 Atlanta Motor Speedway race. The accomplishment bodes well for the organization, not only did the cars need to be fast and the drivers flawless, but the pit crew was also on the hook for this special qualifying session. Unlike other races, drivers completed three laps and stopped for a four-tire change; but here’s the catch, there’s no pit road speed limit. As a result, a fast time reflects on the driver, crew chief, and pit crew. 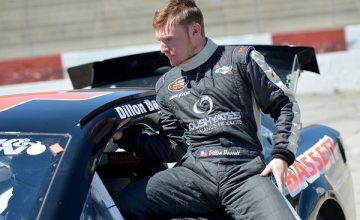 The only practice scheduled for the Open and All-Star race were awash, when the qualifying session began plenty of drivers had yet to take a lap under the new aero package. No driver turned more than five circuits on the 1.5 mile quad-oval. On the topic of adding a practice for teams Saturday morning, Kenseth said, “it’s a coin flip … for me.” He reasoned that when there’s little or no practice teams will hit or miss their mark on setups – that can help jumble the field – but he also said if it were completely up to him he’d opt for practice. The qualifying session began with Jimmie Johnson, the seven-time series champion, setting a time of two minutes, 11.043 seconds. Johnson will start the All-Star race from the 11th, on the inside of row six. Keselowski was next to peel off pit road, scoring a time of two minutes, 9.639 seconds — he’ll start Saturday night from eighth. Stenhouse was the third to go, and he continued the trend of going faster than those who had gone before him. His team was the first to do something interesting on pit road; instead of starting on the right-side of the car the crew began with the left. With drivers speeding down pit road unbridled, NASCAR made it a rule that no pit crew member could leave pit-wall until the car comes to a complete stop. Normally, crews run out ahead of the car but with the special rule a few teams spent time at their shop practicing left-side-first pit stops. Kasey Kahne was the first of a few drivers to slide through their pit boxes. His No. 95 Dumont Jets Chevrolet was accessed a ten second penalty for two loose lugnuts, five seconds per lugnut. He wasn’t the only one; however, Denny Hamlin also slide past his mark. Hamlin had his car in reverse as soon as, if not before he came to a complete stop. 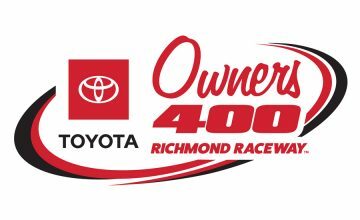 Not one to miss out on a pit road penalty, Hamlin was given a five second penalty for his team not having all equipment at least halfway across the box, towards pit wall. Kyle Larson was the last to qualify but he wasn’t the least entertaining. Without lifting, whatsoever, Larson hooked his Chevrolet onto pit road at full song, fishtailing the first segment of pit road. With all the speed he was unable to woe up his car in time, sliding through at least three full pit boxes. Larson will begin his bid for $1 million from the inside of the ninth row.